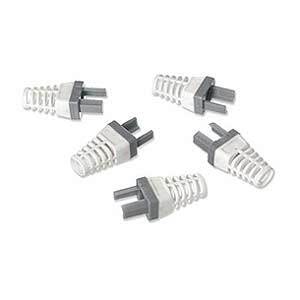 This strain relief is designed specifically for the EZ-RJ45 CAT6 connector. The unique design allows the strain relief to be crimped with the connector, making it an integral part of the complete assembly. Once terminated, the strain relief will not pull off the connector. Electrical performance of the termination is optimized by maintaining the bend radius of the cable exiting the rear of the connector, per CAT6 requirements.